It's time for another round of the Polish Pickup! 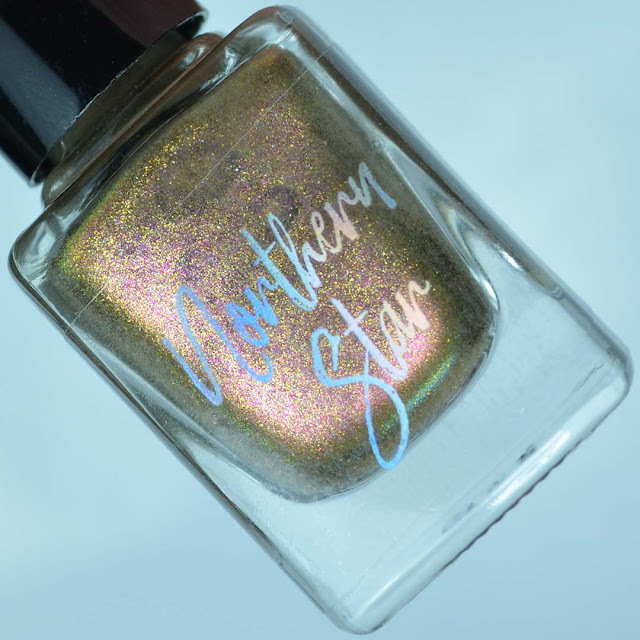 Today's post features swatches and a review of Northern Star Cosmetics I've Heard It Both Ways, and some cute pumpkin nail art for funsies. Formula: A little thick due to high pigmentation but easy to work with. Notes: There is a limit of 60 bottles on I've Heard It Both Ways. 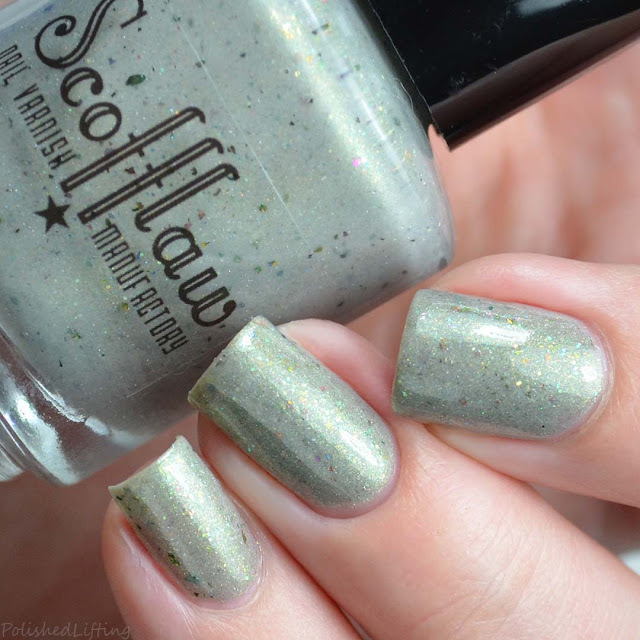 Kristin did not experience staining with this shade but she recommends using a base coat. 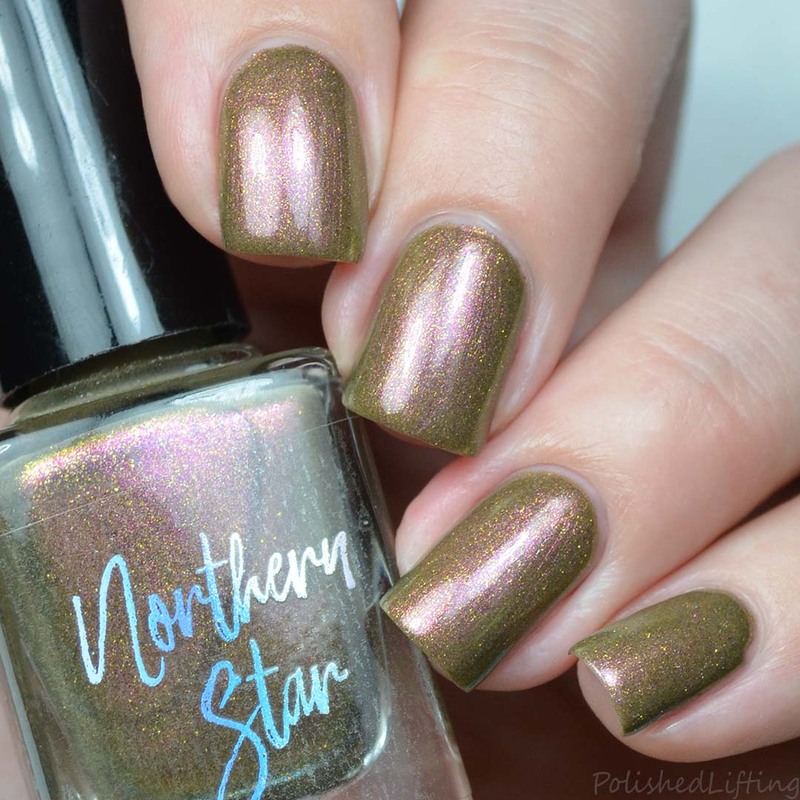 You can find Northern Star Cosmetics I've Heard It Both Ways on the Polish Pickup website from November 3rd through November 6th. The shop opens and closes at 11am eastern respectively. 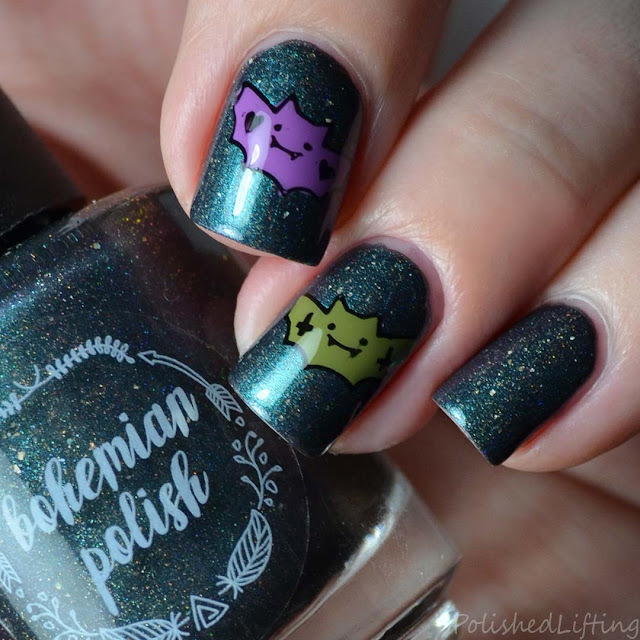 If you enjoyed this post you might like Bohemian Polish No More Unitaskers | Polish Pickup November 2017 and Cute Ghosts & Bats feat. Bohemian Polish. Halloween is tomorrow, and I'm having major regrets not fitting in more Halloween nail art. I had one of the busiest Octobers to date between work and personal engagements. Normally I'd like to do more detailed nail art, but I just haven't had time. Today's post is a simple Halloween look with non-traditional "Halloween" colors. For this look I started with a base of Essie Naughty Nautical. Once that had enough time to dry, I stamped over it using Sally Hansen Insta Dri in Pronto Purple and UberChic Beauty Halloween 2. I have to say, after all these years of stamping, I still love using Sally Hansen Insta Dri for stamping. They always seem to provide a good, crisp image. 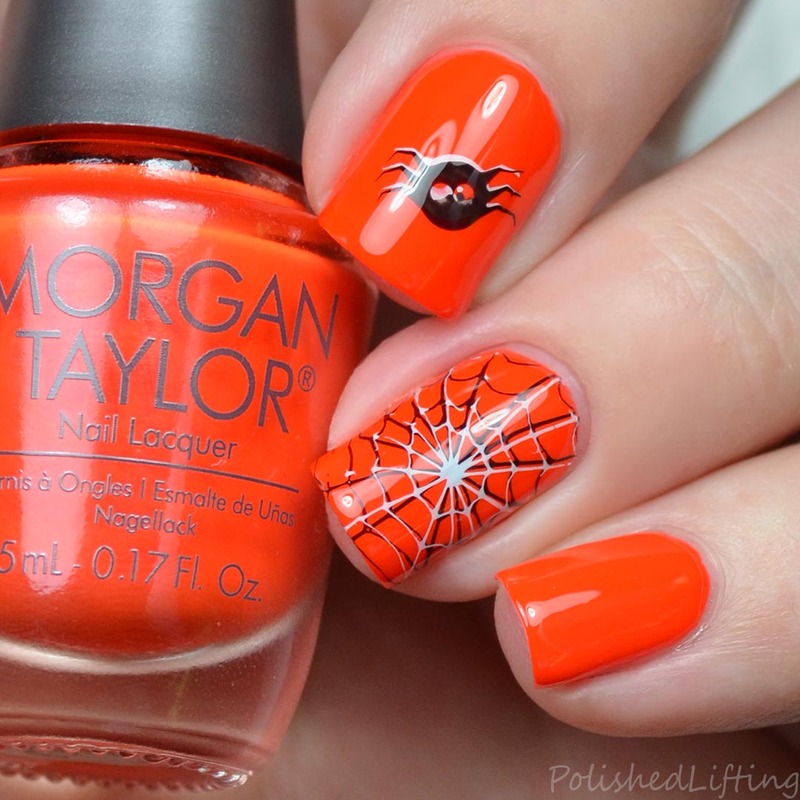 Did you do any Halloween themed nail art this month? 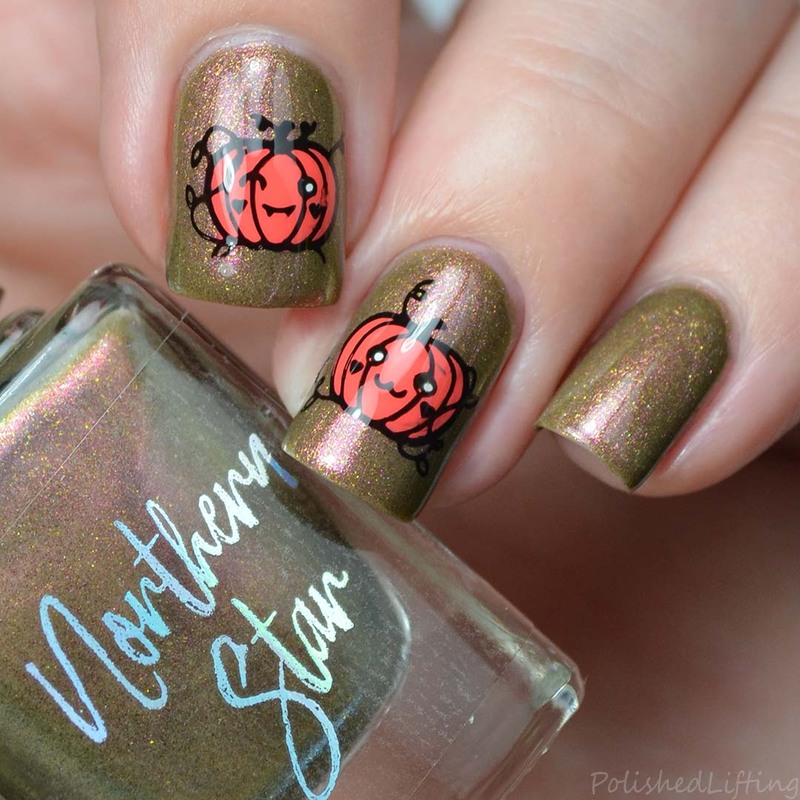 If you enjoyed this post you might like Jackolantern Stamping featuring Firecracker Lacquer and UberChic Beauty and Halloween Ghosts & Cats featuring Painted Polish. 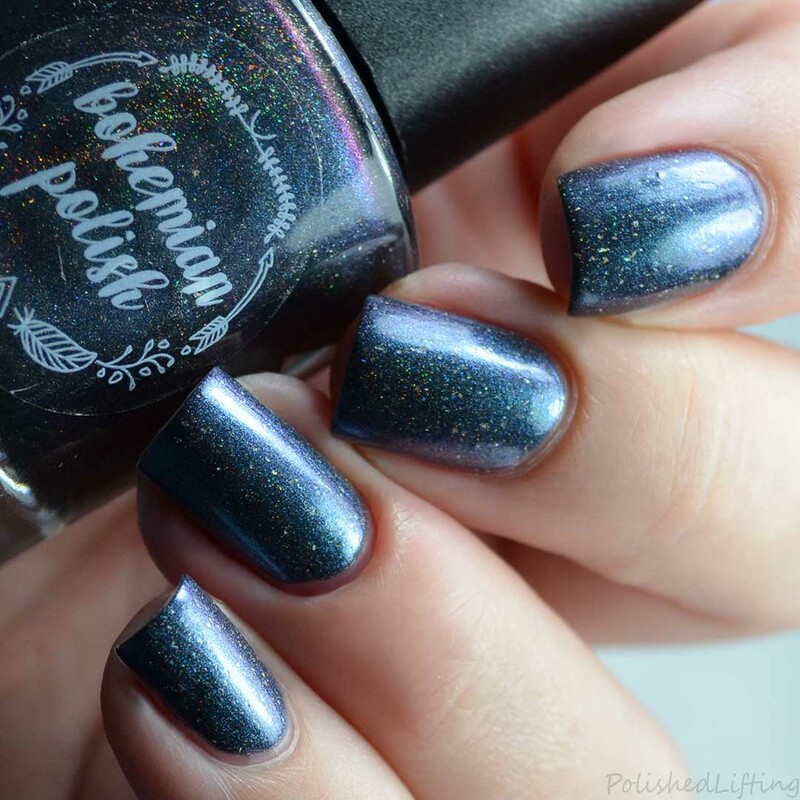 Bohemian Polish has done it again! 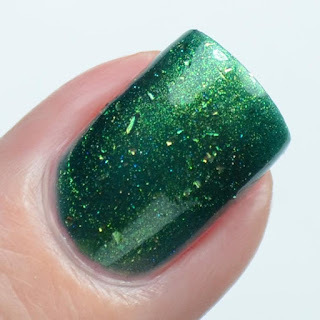 She took a quirky/oddball/fun fandom and turned it into an incredible polish for the Polish Pickup! 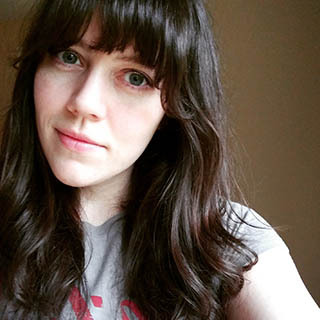 November's theme is Fandoms, so Jen created No More Untaskers as a nod to Good Eats fans everywhere. It even comes with a little Alton Brown inspo video. No More Unitaskers takes its name to heart because it does it all. It shifts colors, twinkles holo, and although I haven't tried yet, it probably stamps. Finish: Aqua to purple multichrome packed with holo flakies and sparkle. Coverage: 2 medium coats. You might be able to get away with a single coat. Notes: The formula is a smidge thick but it's quite easy to use. 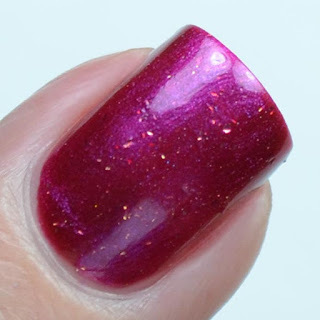 It's important to work quickly and avoid overworking highly pigmented polish such as this one. For this look I started with a base of No More Unitaskers. 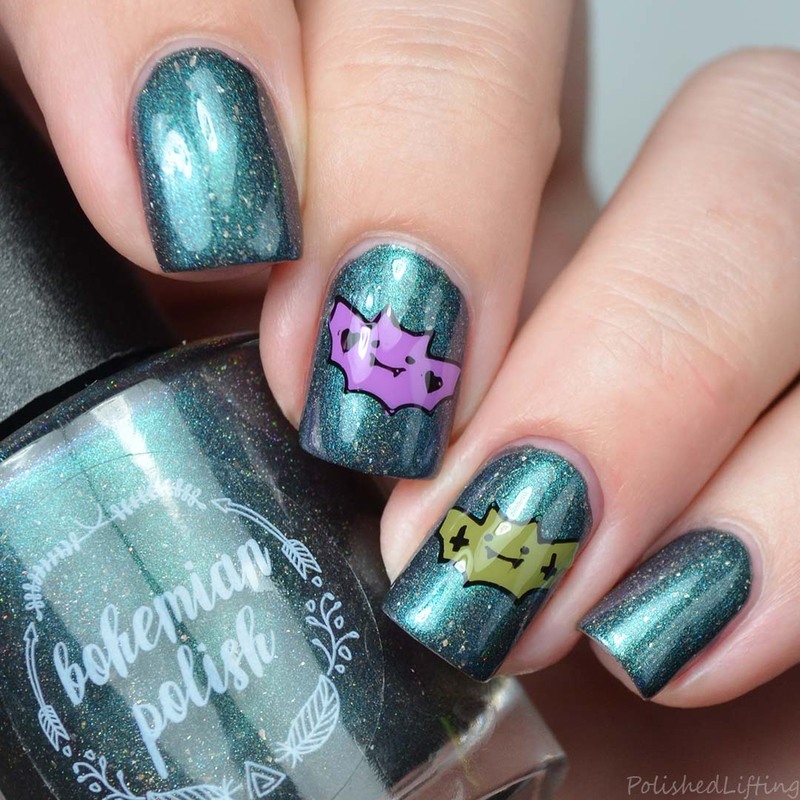 While that was drying I created bat decals from MoYou London Fetive Collection - 53. Once the decals were dry, I topped my accent nails with a thin coat of quick dry top coat. 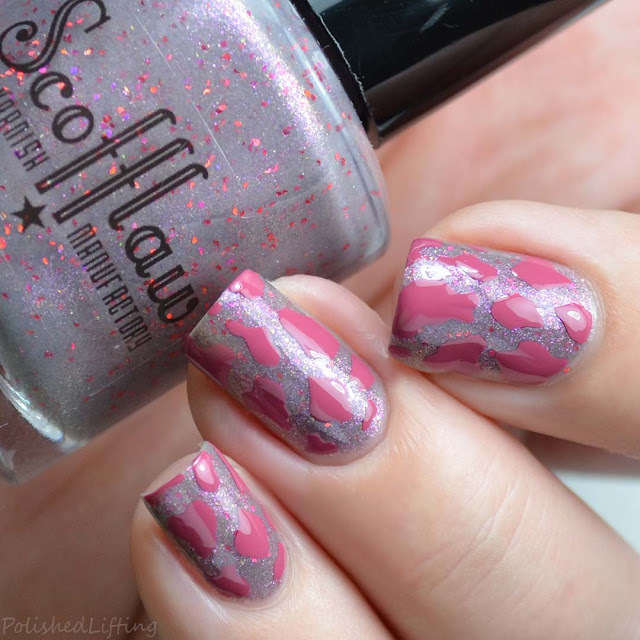 The trick is to transfer the decal to your nail (using the stamper) when your top coat is just barely tacky. 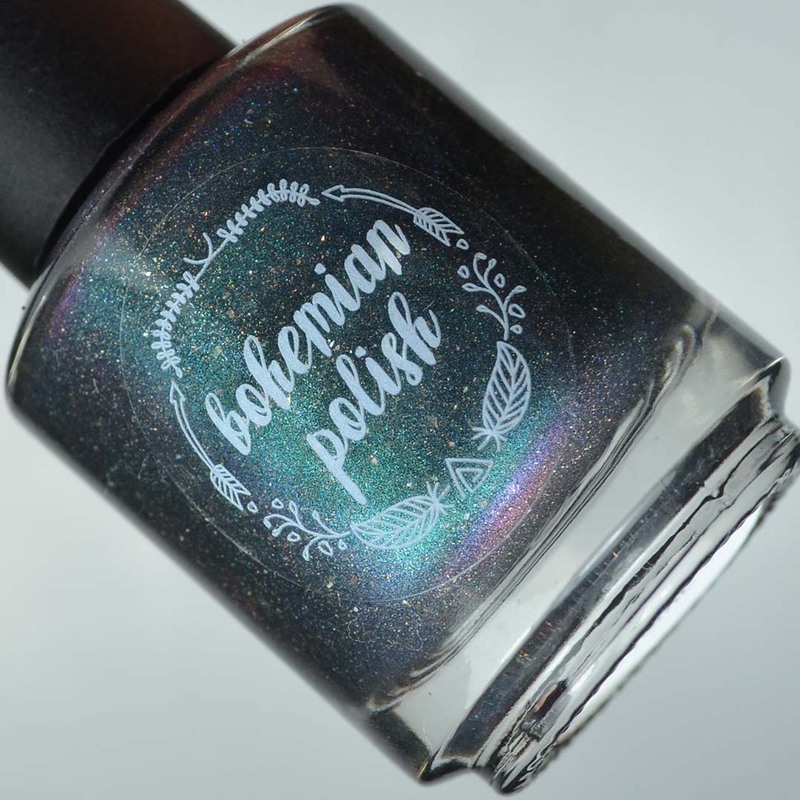 You can purchase Bohemian Polish No More Unitaskers from the Polish Pickup website from November 3rd through November 6th. The shop opens and closes at 11am eastern respectively. 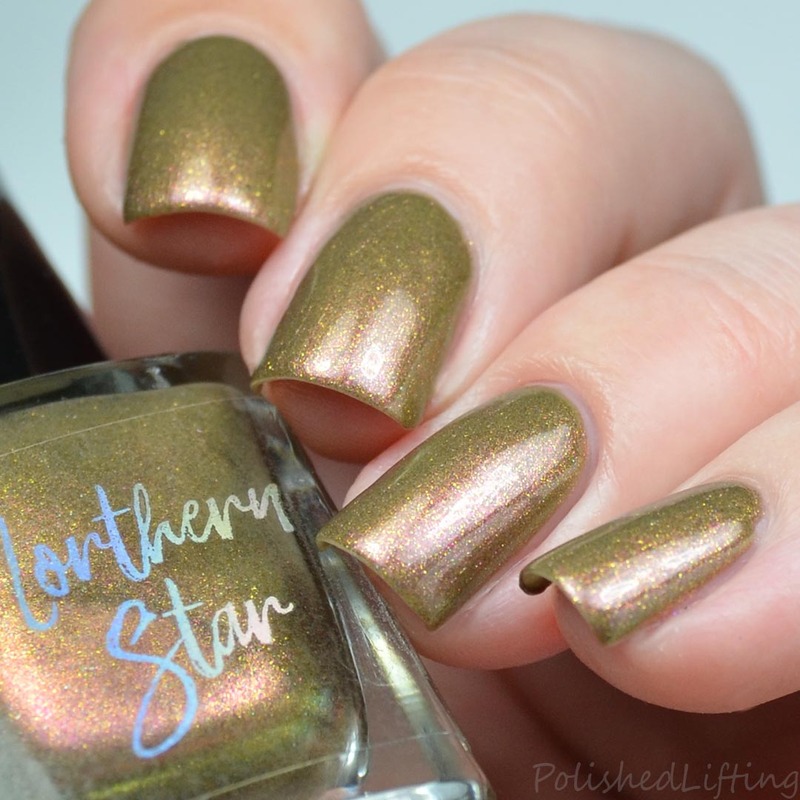 If you enjoyed this post you might like Bohemian Polish Matte About Fall Collection and Bohemian Polish Babashook | Polish Pickup October 2017. After doing a more involved look yesterday I wanted to do something easier with the using the Morgan Taylor Trick 'r Treats set. 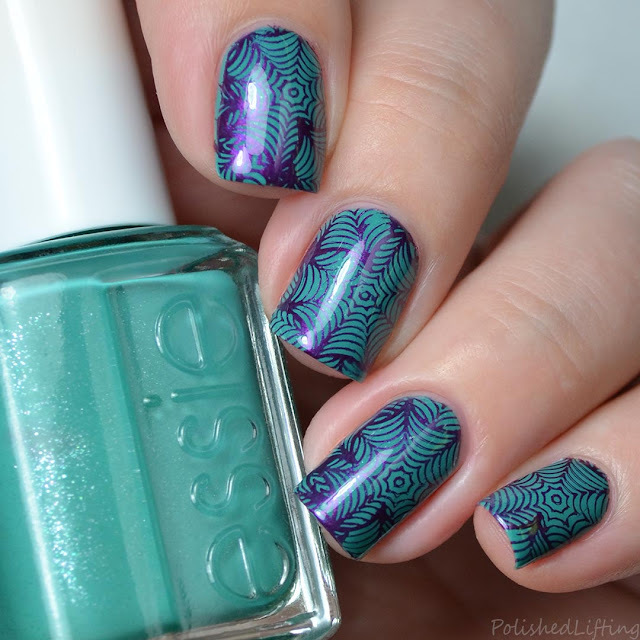 Easy doesn't have to mean boring, and I know that not everyone has the same stamping plates I do. 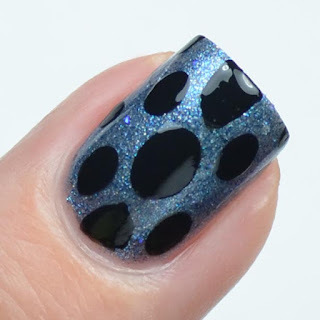 Today's look is a dotticure that anyone can recreate using a dotting tool or any other small, round tipped household items (think bobby pin, straight pin, or paperclip). For this look I started with a base of Morgan Taylor All White Now on all fingers minus my ring finger. On my ring finger I'm sporting Morgan Taylor Orange Crush. Once my base color had ample time to dry, I placed the center dots for each flower using Morgan Taylor Orange Crush. I followed up the Orange Crush dots with five dots of Little Black Dress for each finger. The final step was to apply dots of Little Black Dress down the center of my ring finger to really make that accent pop! If you enjoyed this post you might like Morgan Taylor Trick 'r Treats Halloween 2017 Set and Morgan Taylor Matadora Collection | Fall 2017. I've been playing around with the Morgan Taylor Trick 'r Treats set for a few weeks now, and I have to say it's a great set for Halloween. I paired Trick 'r Treats with the Morgan Taylor Designer Series Plates Celebration 1 to create an easy yet spooky look for the season. For this look I started with a base of Morgan Taylor Orange Crush. My swatches show three thin coats for full coverage. Once that had plenty of time to dry I tackled each finger independently. For my middle finger I stamped the spider with All White Now and then followed up with Little Black Dress once that was dry to the touch. My ring finger follows the same steps as the middle finger. The major difference is that I started with Little Black Dress and eventually stamped over it with All White Now. I love how three dimensional it makes the spiderweb appear. 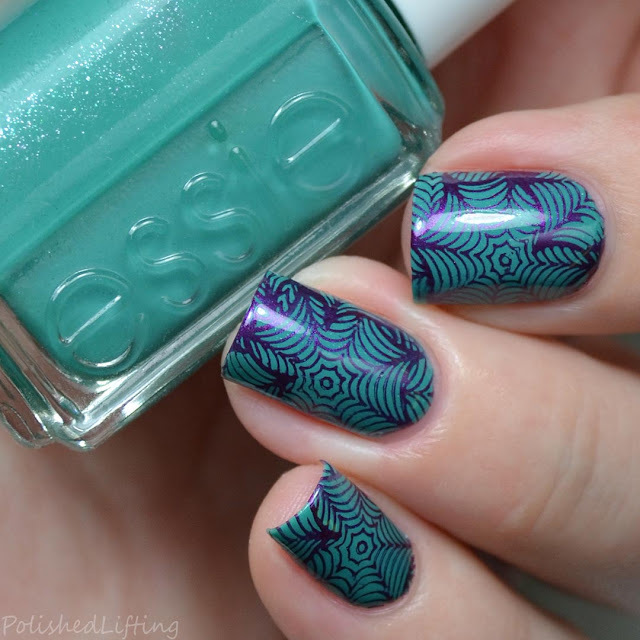 Visual tricks are quite fun in nail art applications. 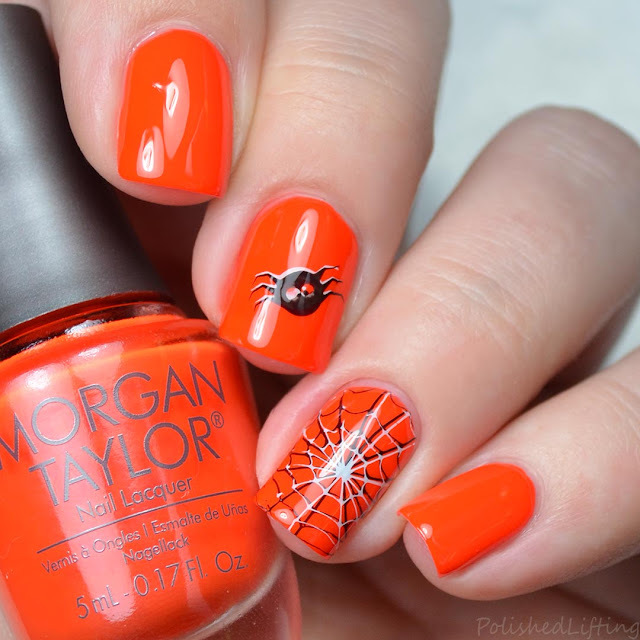 If you enjoyed this post you might like Morgan Taylor Designer Series Plates - Celebrations 1 and Morgan Taylor Trick 'r Treats Halloween 2017 Set. I've finally had a moment to circle back to some swatches of my personal stash, so today will feature ILNP Interstellar. As you might guess by my nail shape, these photos are from late spring. Isn't it just stunning in the bottle?! This one begged to come home with me, and I couldn't say no. In the close up above you can see a bit more teal come through on this shade. At just the right angle, ILNP Interstellar shifts to a rich purple hue. It's a bit elusive out of the bottle, but it's certainly there. Finish: Rich navy with hints of teal and notes of purple all packed with holo glitter. Notes: This has quite a range of shifts all dependent on lighting. The final photo (shown directly above) is how Interstellar appears most frequently. 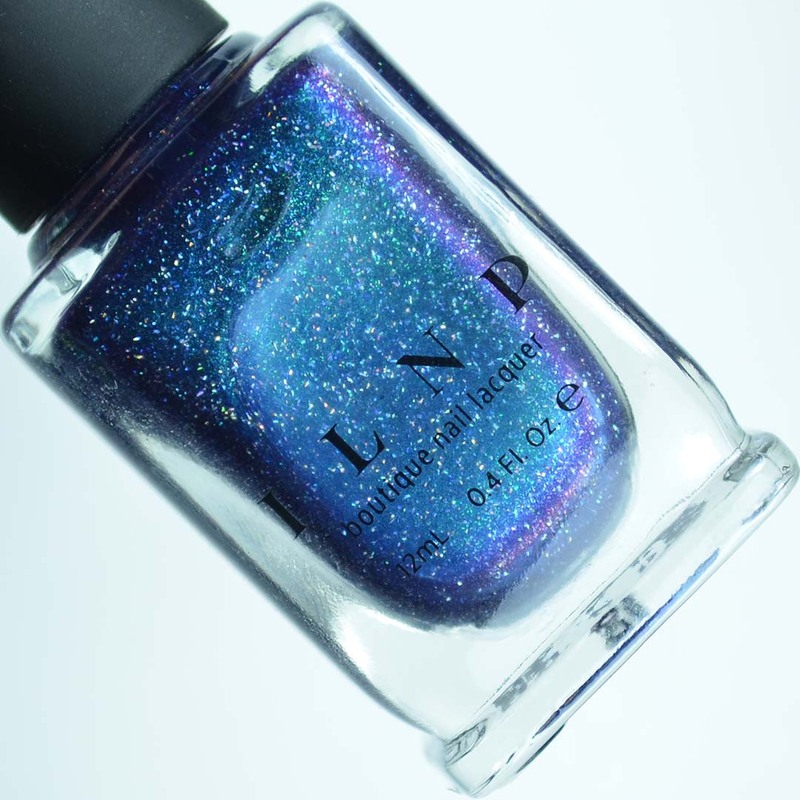 To purchase ILNP Interstellar or any other ILNP shade, be sure to check out the links below. 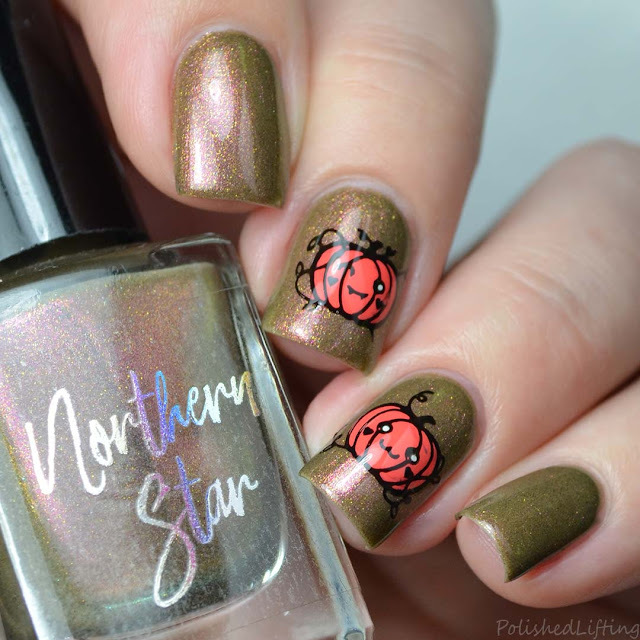 If you enjoyed this post you might like ILNP Color Kissed Ultra Holo Skittle and ILNP Bermuda Breeze. Baroness X is releasing the Alchemist Collection this Saturday, and I think you guys are going to love it! This collection was based on the wildly popular book The Alchemist by Paulo Coelho. 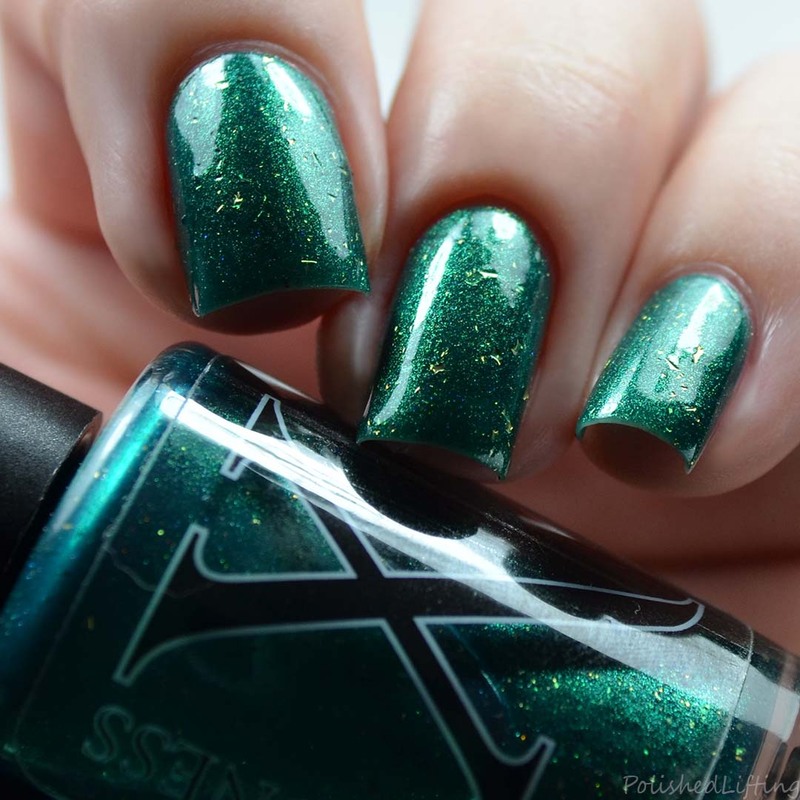 The Baroness X Alchemist Collection features four shades based on recurring themes in the book. 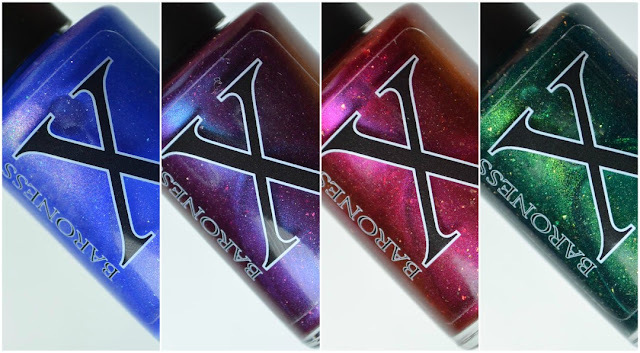 The shades from left to right are: Soul of the World, Language of the Universe, Elixir of Life, and Philosopher's Stone. Notes: The subtle shift of the shimmer in Soul of the World is exquisite. 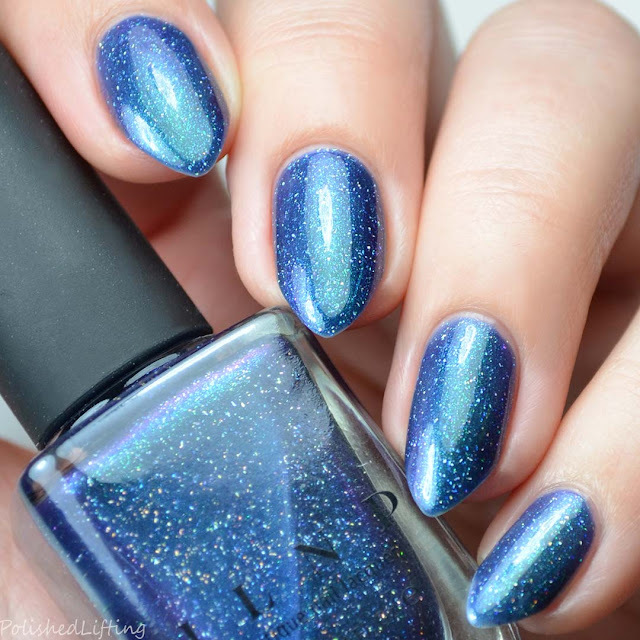 I feel as though the holo paired with the shimmer elevate this shade. Notes: Language of the Universe is a limited edition shade. Notes: Elixir of Life is a limited edition shade. 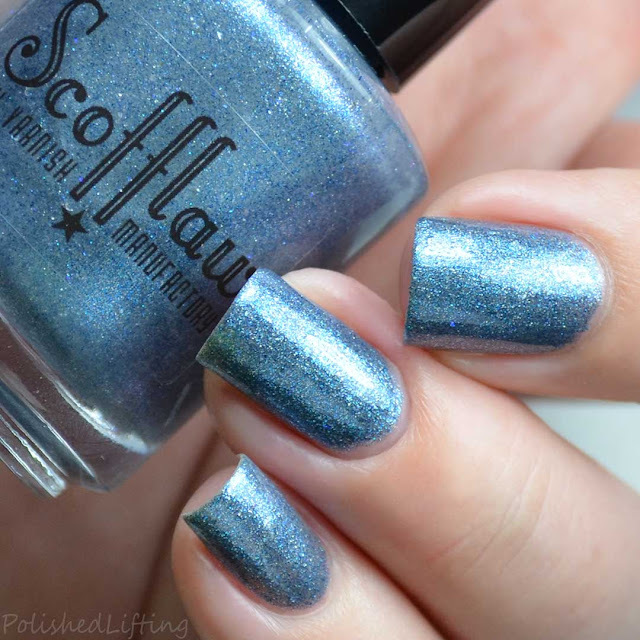 This is one of my top shades from this collection due to the extreme shift. Notes: Philosopher's Stone is most interesting (to me) when viewed in low light. While that isn't terribly feasible for photos, I did my best to capture the effect in my final photo. Lower light is when the teal comes out to play. The Baroness X Alchemist Collection will be available on Saturday, October 21st at noon pacific. Each polish will retail for $11/bottle. Full size sets will be priced at $40/ea, and 8mL minis will be $24/ea. There will be 15 mini sets available at the time of launch. Once they sell out they will not be restocked. If you enjoyed this post you might like Baroness X Ghost Themed Halloween Trio and Baroness X Shift In Space-Time Collection. Is there anything better than Halloween? I think not! 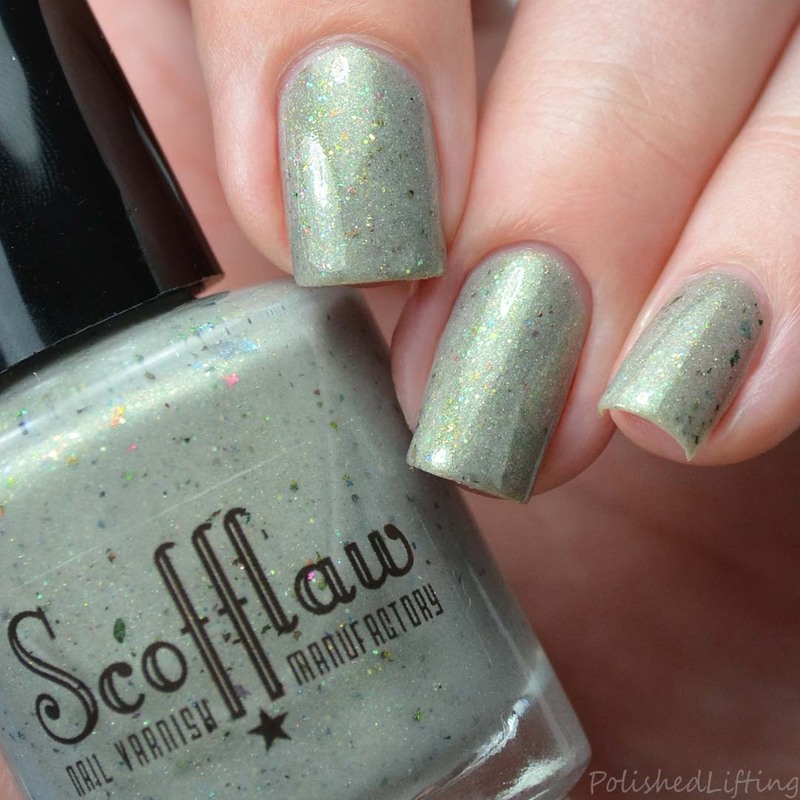 Today's post is packed with all kinds of Halloween goodness from Scofflaw Nail Varnish. This three piece collection is unlike any other Halloween release you will see. It's interesting, seasonally appropriate, and not at all typical. Where Did That Spider Go?! Finish: Gray shimmer crelly with copper-green multichrome flakes, scattered holo, and gold-copper-green shifting shimmer and flash. Notes: Where Did That Spider Go?! is my favorite shade of the bunch. I'm entirely enchanted with the overall green feeling about this one. Finish: Gray shimmer crelly with cherry red metallic micro shards, violet sparks, and warm pink-carmine sparkle flecks and highlights. Notes: I Bind You Nancy is a close second when it comes to favorites. 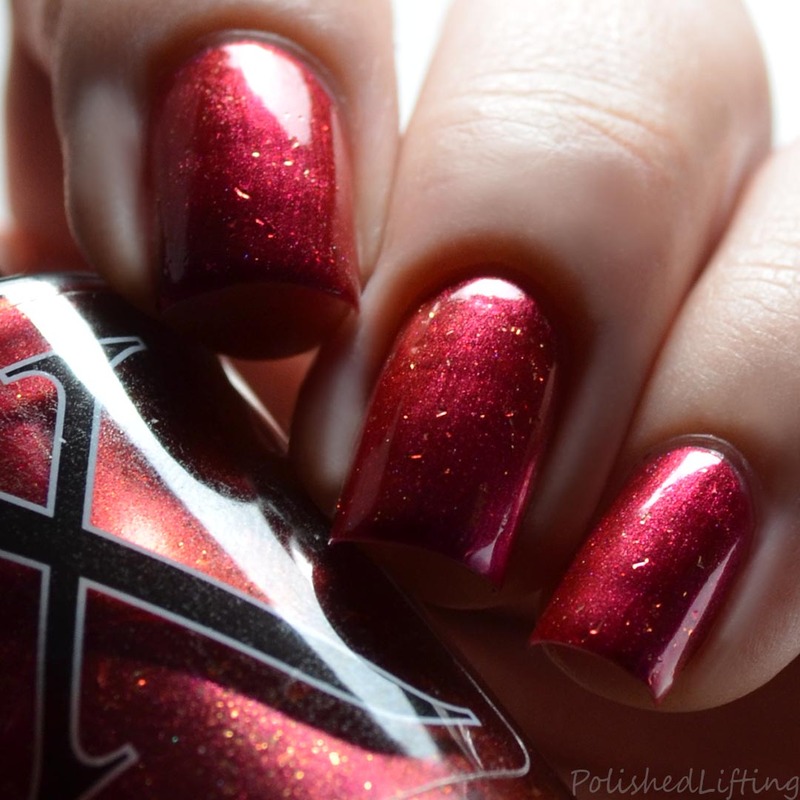 The twinkly red shards really make this shade for me. It's a curious contrast that works really well. Finish: Gray shimmer crelly packed with blue and silver sparkles, Blue-purple iridescence, and multiple shades of blue flakes and shimmer highlights. Notes: 668: Neighbor of the Beast is an interesting shade. The silver in this gives it a smooth metallic feel without any of the streaky behavior that is generally associated with metallic shades. 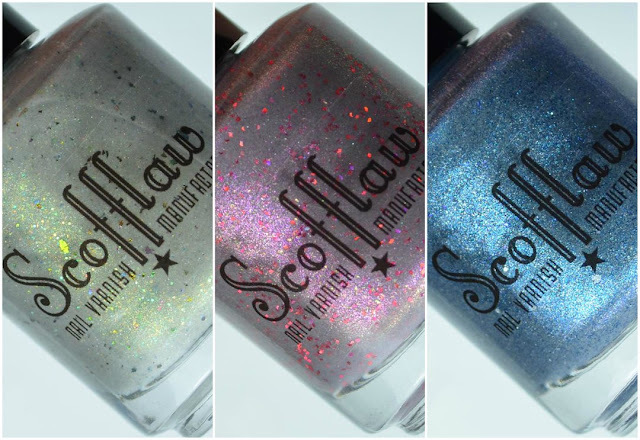 The Scofflaw Nail Varnish Halloween 2017 LE Collection will be available on Friday, October 20th at 7pm central. The set will retail for $30. As a "treat" Finch is offering free shipping if you buy the set of three. 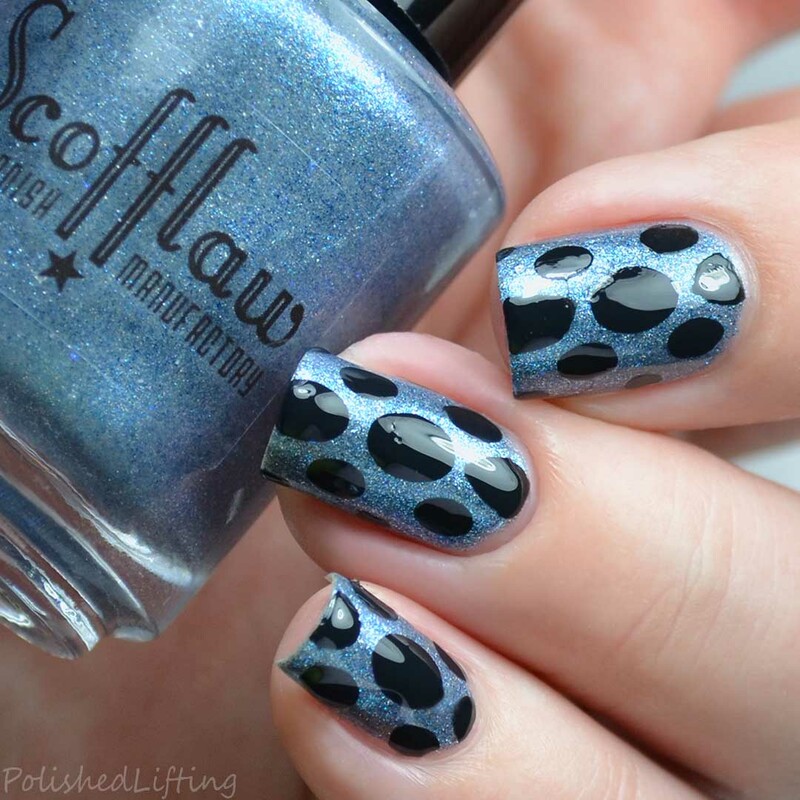 If you enjoyed this post you might like Scofflaw Nail Varnish Fall 2017 Collection and 31dc2017 - Negative Space Stripes feat. 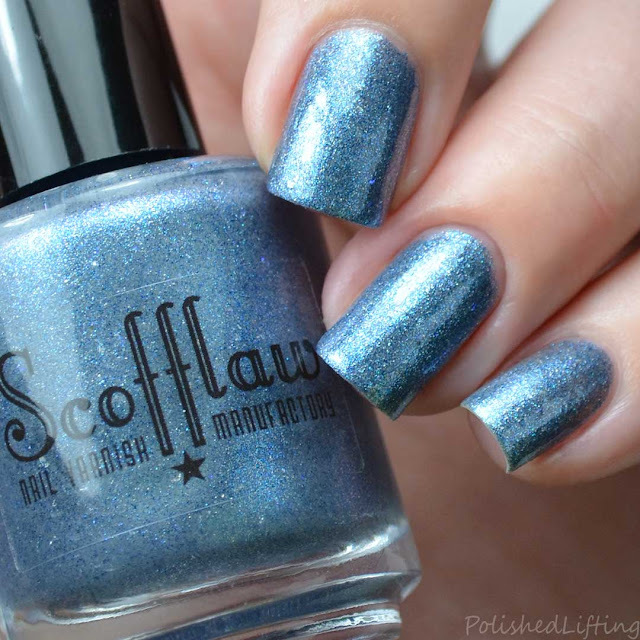 Polished Vino & Scofflaw Nail Varnish.